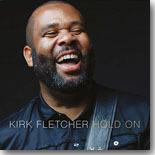 For Hold On, his fifth album as a solo, guitarist Kirk Fletcher teamed with drummer Matt Brown and keyboardist Jonny Henderson to record in a classic organ trio setting. He penned all eight of the songs with a little help from a couple of friends, and he plays some of the finest guitar that I’ve heard on a blues album (actually, ANY genre) this year, which is no surprise given his already-impressive résumé previously serving as guitarist for the Fabulous Thunderbirds, Kim Wilson, Charlie Musselwhite, Doyle Bramhall Sr., the Mannish Boys, and Joe Bonamassa at various times over the past couple of decades. The scorching opener, “Two Steps Forward,” finds Fletcher sharing spirited vocals with Mahalia Barnes and adding some equally spirited wah-wah guitar work (with nods to Hendrix and Layla-era Clapton as well) that more than likely resulted in more than a few jaws hitting the floor in the studio. On the soul burner, “You Need Me,” Fletcher hits a deep soul vein with his vocals and his nimble guitar. The trio head on down to New Orleans for the energetic “Sad Sad Day,” hitting a mean second line groove that dares listeners to sit still. “The Answer” is the album’s centerpiece --- a splendid slow blues clocking in at just over eight minutes. Fletcher’s guitar work is breathtaking, stunning in its poignancy as well as its potency. “Time’s Ticking” is a crunching mid-tempo blues rocker with drums at a marching pace and a positively blistering guitar solo. The instrumental “Dupree” is a nice change of pace, an upbeat tribute to the late jazz /blues/R&B guitarist Cornell Dupree, one of Fletcher’s heroes. “Gotta Right” is a Chicago blues shuffle which is Fletcher’s purest blues track on the disc, and he really burns it up on guitar and vocals (it’s been really cool to watch him gain confidence as a vocalist over the years). On the closing, gospel-flavored title track, Fletcher pleads for worldwide unity with sweet vocal backing from Jade McCrea. Hold On is a superb entry into Kirk Fletcher’s solo catalog. Already one of the best blues guitarist currently practicing, he’s rapidly becoming an excellent singer and songwriter as well. Blues guitar fans need this disc in their collection.